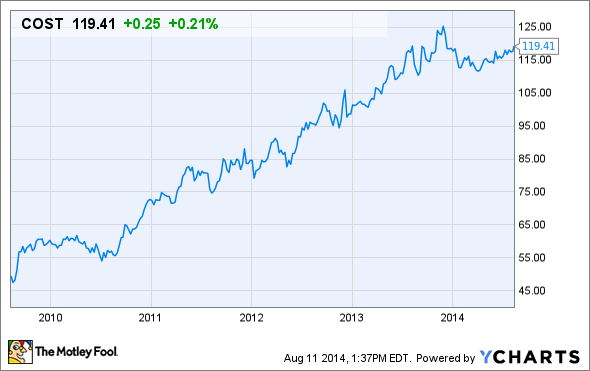 Costco stock has stalled out in the last year, but it still has plenty of long-term upside. After more than doubling in the first few years after the Great Recession, Costco Wholesale (NASDAQ:COST) stock has leveled out in the last year. Since summer 2013, shares have been stuck in a $110-$125 trading range. This share price stagnation can be explained in large part by a sharp slowdown in Costco's earnings growth. Analysts expect the wholesale retailer's earnings per share to grow just 2% year over year in fiscal 2014, to $4.59. Obviously, earnings growth will need to accelerate for Costco stock to perform well going forward. Fortunately, the company has three important business drivers that could send shares marching higher again. While Costco's earnings have come under pressure in the past year, sales growth has remained strong. The issue has instead been a slight dip in the retailer's profit margin, as the company made a strategic choice not to pass on food cost inflation to customers in order to build loyalty. This was magnified by the fact that Costco operates on razor-thin margins. Excluding the impact of gasoline prices and foreign exchange rates -- both of which tend to be volatile -- Costco's comparable-store sales have risen 6% in each of the last three years. The company is on pace to post another year of 6% comp growth in fiscal 2014. Costco has been posting strong comparable-store sales growth recently. Photo: The Motley Fool. Costco's consistent comparable-store sales growth, along with its steady pace of new warehouse openings, is driving a long-term revenue growth rate in the high single digits. The company's long track record of steady growth and an industry-low cost structure suggest that its growth rate will be sustainable for years -- or even decades -- to come. A second positive driver for Costco stock is the company's expansion in international markets, where it faces less competition. In the U.S., Costco faces direct competition from two rivals: Wal-Mart's Sam's Club and BJ's Wholesale Club. By contrast, the discount warehouse club concept is much less developed outside the U.S.
Lower competition means that Costco can earn higher margins abroad. In fiscal 2013, Costco's operating margin was 2.4% in the U.S., but hit 4.4% in Canada and 3.9% in its other international markets. Part of this gap in profitability is the result of Costco's stock-based compensation (and some other overhead costs) being allocated to the U.S. segment. However, even without the impact of this accounting issue, Costco would be more profitable outside the U.S. This is important because 466 of Costco's 660 warehouses are today located in the U.S. While the company is still opening warehouses in its home country, most long-term growth will come from international markets, where it can earn higher margins. Costco has plenty of room to grow in Asia, and it just opened its first store in continental Europe in May. As international markets come to represent a larger portion of Costco's business, the company's profit margin should gradually rise. The combination of high single-digit revenue growth and expanding margins should allow Costco to achieve double-digit long-term earnings growth. The last potential driver of long-term Costco stock gains is member loyalty. In the U.S. and Canada, Costco's two most mature markets, membership renewal rates have reached 90%. That's a considerable show of customer loyalty, given that there are a variety of reasons why someone might drop a Costco membership, aside from being dissatisfied (for example, moving, becoming an empty nester, or experiencing a change in household income). This loyalty gives Costco pricing power. In the past, Costco has tended to raise annual membership rates by $5 (or $10 for executive members) every five years or so. The last increase went into effect in late 2011. In another two years, Costco could consider another membership price increase, which would likely bring in $200 million-$300 million in incremental pre-tax profit. Costco shares currently trade for about 23 times forward earnings. That makes it more expensive than many other retail stocks. However, that premium is fully justified by the three key factors above. Of course, this doesn't mean that Costco stock is a sure thing. E-commerce usage is growing rapidly, led by Amazon.com, and Costco has a relatively small foothold in that space. Nevertheless, Costco's industry-leading cost structure is a potent tool to retain customer wallet share. Costco is likely to return to a faster earnings growth trajectory as soon as next year, as its margin issues begin to ease. That is likely to rejuvenate the stock and lead to above-market returns for long-term investors.